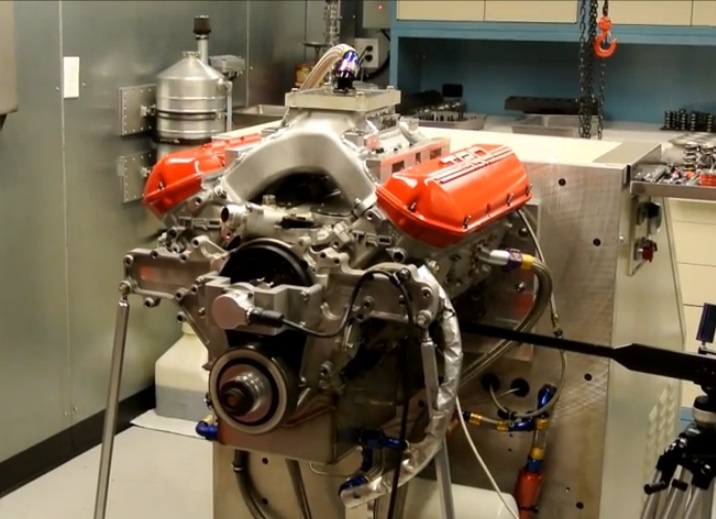 Watch And Listen To This NASCAR Engine Get Spintron Tested To 9,000 RPM – Wild Stuff! The Spintron machine is one of the greatest tools ever devised for race engine builders, valvetrain manufacturers, and people who make their living making horsepower on the highest levels. This is a piece of equipment that allows the tester to run an engine without actually firing it up and it is equipped to monitor any number of systems and process inside said engine to give as much data as possible. In this video you will see a Toyota NASCAR engine spun to (we believe) about 9,000 RPM. The video says eight but the camshaft speed (half the crank) seems to indicate more RPM than that. You can watch the screen and tell us whether we are right or wrong on that assumption. We know of teams that test everything from oil life to valvetrain pieces on these machines and they do so because it is so precise and so much easier to use than a typical dyno. The Spintron will not measure horsepower, which makes sense because the engine is not producing any. It is being driven by a big electric motor to the desired speed. The complete lack of even headers for this test shows why professionals love these babies. Just bolt it on, set up your test equipment and GO. Our favorite part of listening to the “pulls” on the machine? The sound of the valvetrain parts working and simply listening to the air travel through the engine. If anything, the combustion process seems to be a noise amplifier for the already talkative engine. You may disagree but even just on the Spintron machine, if you closed your eyes, you’d know it was a NASCAR engine immediately. Just the tone and temper of the sound if a dead giev away. This is a neat look into the tuning process! Do they only have valves in one specific cylinder? How could that engine run at all with the exhaust ports blocked off (except for the one)? Even with no fuel, the engine is still compressing air and needs to expel it on the exhaust stroke of the piston. What am I missing here? The engine isn\’t running, it\’s being spun by an electric motor. They\’re testing valve train stability.